The story of A L'Olivier began in 1822 in the Marais district in the heart of Paris. Mr Popelin, a pharmacist at the time, decided to set up a stall devoted to olive oil. This pioneering man of vision was already aware in 1822 of modern press claims that are bolstered by extensive scientific studies : the Green Gold is an elixir. For years he vaunted the merits of olive oil to Parisians and in time the firm became the haunt of lovers of the Mediterranean art of living. Our oil is obtained from three varieties: the Aglandau, which is the dominant variety, gives fruitiness and suppleness with its artichoke and almond flavours. The Tanche reinforces the perfume, and the Picholine gives character. 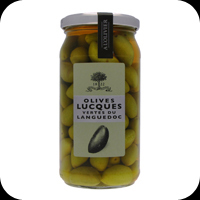 The olives are harvested later here than at Aix en Provence and the fruit flavour is riper. It possesses an overall spiciness with a pleasant peppery aftertaste. This well balance, medium style oil has an attractive aroma of citrus fruits, cut grass and culinary herbs with flower undertones that leads on to a salad bowl of complex leafy flavors in the mouth. Le fût, the drum, il fusto … a common object in the olive oil world, but so precious in protecting the oil from ultraviolet rays and so practical for transporting, stocking and transferring the oil into bottles. We have designed and produced a miniature replica of the industrial drums that take roughly two hundred litres of oil. This version contains 750ml. In this original packaging, both in gift form and as a simple functional drum, we propose an extra virgin olive oil, a vintage blended in our workshops from olive oils from the Mediterranean basin. Obtained from fresh herbs, by direct transfer of their aromatic components, essential and oleoresin oils, our basil oil stands out by virtue of its strong flavour of freshly picked sweet green basil. This remarkable oil is used in all preparations requiring very aromatic basil: tomato and mozzarella salad, stuffed tomatoes, goat’s cheese, ratatouille, fried red mullet, stews, soups, and of course fresh pasta. This delicately flavoured oil speaks to the soul. The flavour leads you to the vast lavender fields in Provence. Use this infused olive oil for baked chicken, drizzle over vegetables, or toss with simple greens and lemon juice. Infuse bakes goods with the scent of lavender or drizzle over gelato and chocolate dishes. This Asian oil is rich in phospholipids and essential fatty acids. It is prepared in the Asian manner - grilled and then crushed – to give a superior flavour. Using a little of this very sophisticated oil at the end of cooking will give a very Asian flavour to many dishes. It can be heated, and is particularly suited to wok cooking. A L’Olivier hazelnut oil is made in our Poitou mill (southwest France) in much the same way as our walnut oil. It has the exquisite flavour of roast fruit and is mainly used a dressing for raw vegetables. It goes particularly well with endive, avocado and tomato salad. We recommend combining it with mature wine or raspberry red wine vinegar. Thanks to its particular flavour, hazelnut oil is also used in patisserie. Virgin Argan oil is extracted from the almond of the fruit of the Argan tree, which is a small thorny tree only found in the South West of Morocco (the Essaouira-Agadir region). Rare and precious, this oil has been recognised for centuries by the Berbers of the Atlas Mountains for its gastronomic, nutritional and cosmetic virtues. Our oil is extracted form the first pressing of lightly roasted shelled almonds and is then filtered. Argan Oil can be used in cold or hot dishes and with savoury, seafood or sweet food. As a salad dressing, we recommend using it with lemon juice. This aromatic composition made with olive oil, fresh garlic and fresh thyme stands out by way of its original flavour. The perfume of garlic predominates at first and the thyme’s freshness comes through in the aftertaste. A L’Olivier’s chilli and herb infused extra virgin olive oil is made by crushing small pimento hot chilli and peppercorns, and blending it with rosemary and thyme aromatics. A real help in the kitchen, this spicy oil can be used sparingly to season couscous, pasta, chilli con carne or pizza. Packed with pimento chillies punch and aromatic herbs, it tastes as delicious as it looks. The embossed bottle of olive oil from A L'Olivier is a stunning feature of timeless classic design, but tastes too good to keep as decoration. Superb strong chilli taste with a twist. Olives Noires à la Grecque - These fine olives are mature. They have lost their bitterness, their skins are wrinkled and they have acquired a slightly fruity taste, typical of Greek black olives. They are prepared with herbs from Provence, so they are ready to decorate your pizzas and onion tarts or to be associated with green olives in your salads and as an aperitif.